The Advanced Landline Phone for Dementia is packed with useful features but remains easy to use to get in contact with loved ones. SKU: 9925 Categories: Arthritis & Parkinson's, Arthritis Aids: Gadgets for Grip & More, By Symptoms / Effects, Connecting People & Isolation, Gifts for the Visually Impaired, Macular Degeneration, Making Life Easier, Memory Loss & Confusion, Your Daily Living Aids, Gifts, Gifts Under £150, Gifts Under £100, Gifts for Her, Gifts for Him, Gifts for Grandparents, Gifts to Make Technology Easier, Phones, Landline Phones For The Elderly, Doro Home Phones (Corded), Big Button Phones For Elderly, By Condition, Dementia & Alzheimer's Products, Hearing Problems, Low Vision Aids & Phones for the Blind, Stay in Touch. Tag: VAT Relief Available. 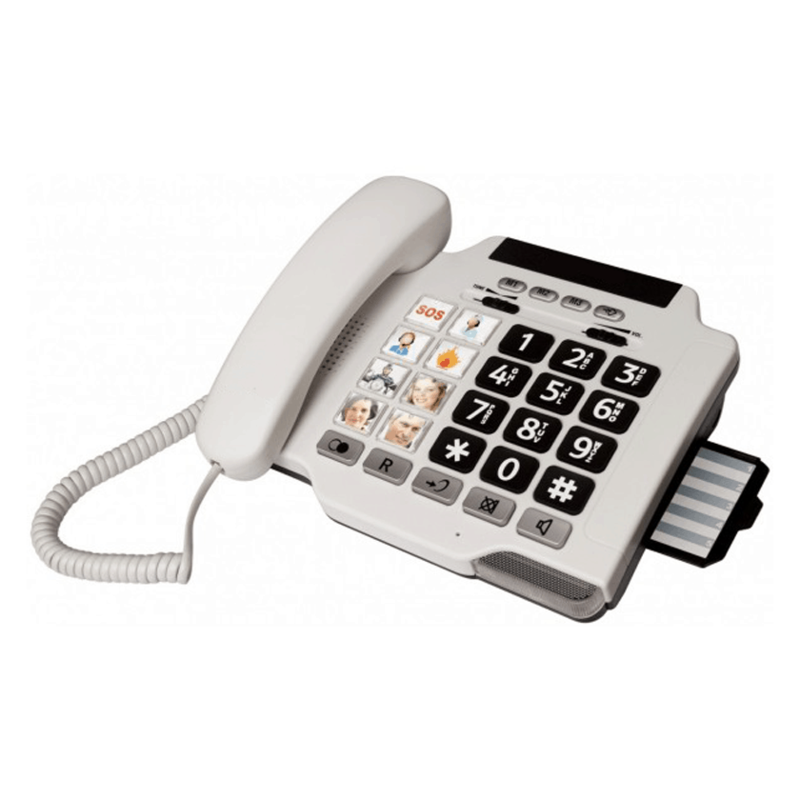 The large, one-touch photo dialling buttons make remembering and dialling any number easy. 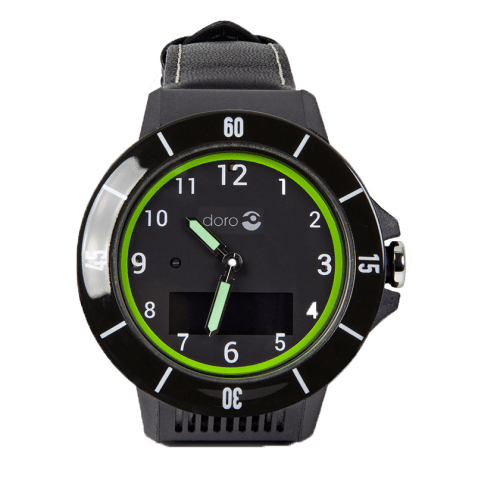 The user simply presses the button and that pre-set contact will ring. They’re also a breeze to change, just pop open the button cover and slide in a new picture of your loved one or an image (e.g. medical cross) before adding their number. 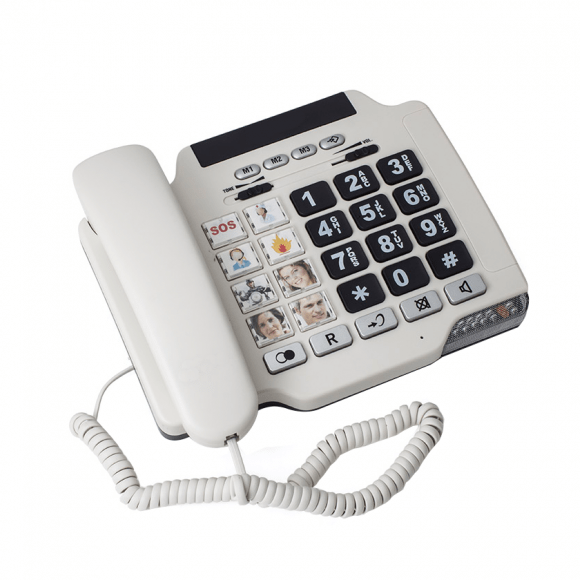 The comfortable Advanced Landline Phone for Dementia has an ergonomic, low profile design. This reduces strain by being easier to use from a sitting or wheelchair position. 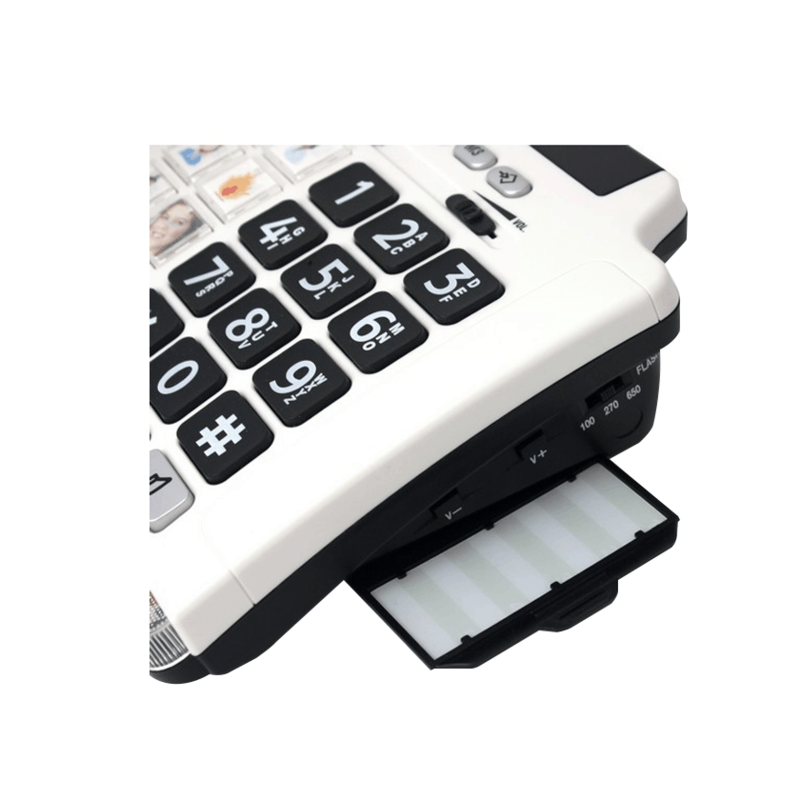 The concave and high contrast keys on the Advanced Landline Phone for Dementia also have a low reflection surface. This makes them easier to see, distinguish and clean if something is spilt onto them. This Landline Phone for Dementia’s visual ring indicator means a light will flash brightly when the phone is ringing, ensuring it’s obvious when someone calls. This is especially useful for people with hearing problems and may otherwise not hear the phone ring. 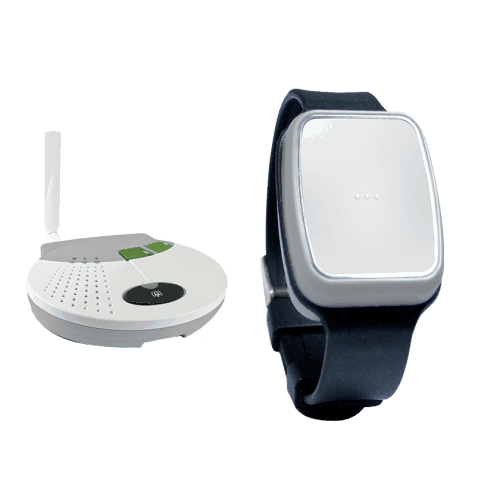 The Advanced Landline Phone for Dementia is hearing aid compatible (HAC). 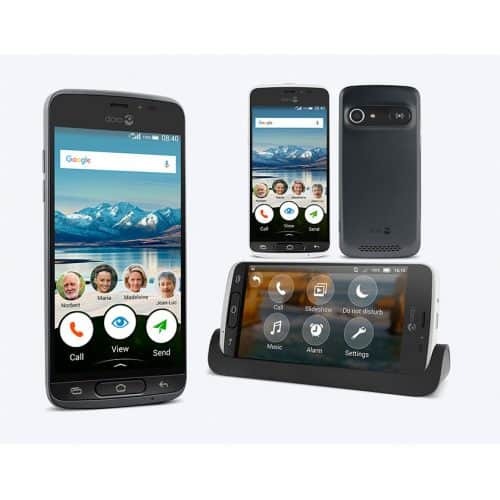 This phone will work with all kinds of hearing aids on the ‘T’ setting, making it more accessible for those with hearing impairments. The high quality speaker of the Advanced Landline Phone for Dementia produces loud, crisp and clear sound. The volume can also be adjusted to their needs, making it easier to hear for people with hearing impairments. This Advanced Landline Phone for Dementia has the convenient function of pressing a single button to redial the last phone number, making it quicker and easier to phone loved ones or call back someone if they did not make it to the phone in time. Our expert team are always on hand to answer any questions you may have on our landline phone for dementia. If the Advanced Landline Phone for Dementia is not what you are looking for. Click here to be redirected to our homepage.